My Buggy Buddy is a UK manufacturer of innovative pushchair and travel accessories. 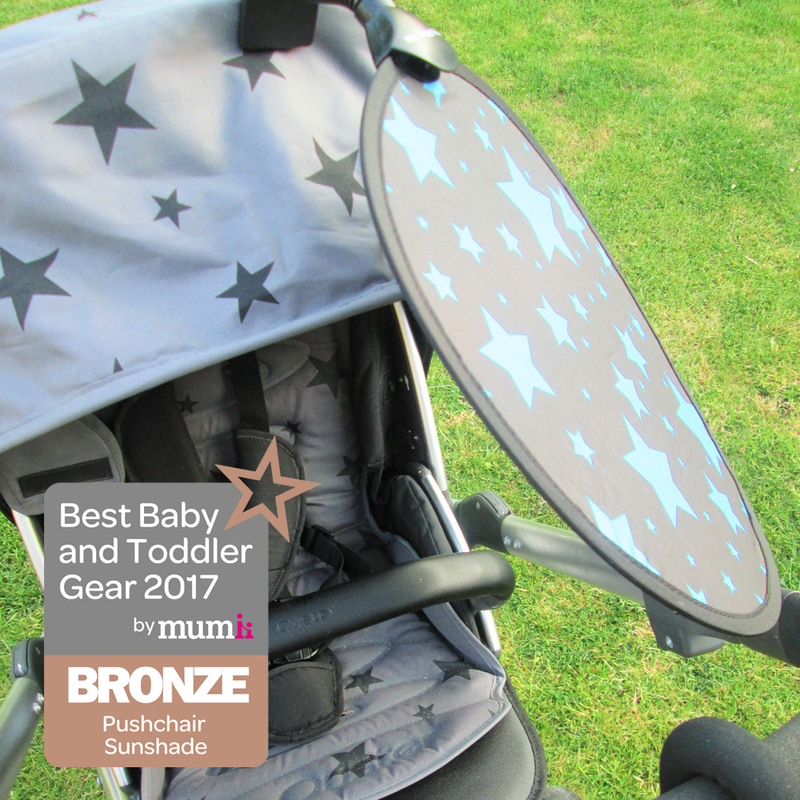 Its award-winning range features the clip-on UPF50+ My Buggy Buddy Sun Shade for use in the car, car seat or pushchair. Parents wonder what they ever did without it! What is the My Buggy Buddy Sun Shade for? Shading our children from the sun's harmful rays can be a battle. Children naturally hate getting the sun in their eyes. Yet traditional parasols are large and rigid, and need constant adjustment when carried alongside the pushchair. My Buggy Buddy offers an ingenious solution. This portable sunshade has a large surface area to shield against the sun's rays. The robust clip attaches to a bendy stem that is easy to adjust. As a result, you can pop the sunshade open and use it anywhere. Fix to a stroller, your car's grab handle, the car seat - even a windbreak on the beach. A perfect, cost-effective gift idea for parents and carers. What are the benefits of using a My Buggy Buddy Sunshade? The sunshade is made from UPF 50+ material. This offers the greatest protection from harmful UV rays. The My Buggy Buddy Sun Shade can be squeezed into a little carry bag so is small enough to live in your car glove compartment, your changing bag or pushchair. Fix the sunshade to the canopy of your pushchair and the sunshade provides full protection over your child's delicate face. No more cries of "Mum! I can't see!" What designs of the My Buggy Buddy Sunshade are available? The My My Buggy Buddy Sun Shade comes in sleek black, or with a fun Blue Star / Pink Star pattern. Where can I buy a My Buggy Buddy Sunshade? Buy My My Buggy Buddy Sun Shade at a great price from BuggyBaby. Add some other pushchair accessories to your basket and you can enjoy free 48hr delivery on orders over £50!